When it comes to orthodontic issues, there are no shortage of treatment options and services available from our Sunset Hills MO orthodontist. If you’re in the market for orthodontic treatment and interested in Invisalign, it’s important to research how it works before making a choice. This can be a daunting task, especially when there’s an abundance of information out there and you’re not sure what’s accurate. Our Sunset Hills orthodontist is committed to spreading awareness about the benefits of orthodontic treatment and its role in maintaining good overall health. In the case of Invisalign, there are numerous benefits to share and a few common myths to debunk. The length of any treatment from our orthodontist in Sunset Hills depends, in part, on the severity of your issue. For example, someone needing many teeth moved will require a significant amount of treatment time, regardless of whether they wear braces or Invisalign. In most cases, Invisalign works just as well as braces and takes a comparable amount of treatment time. There are even certain situations in which our Sunset Hills MO orthodontist believes Invisalign is more effective than braces. Ultimately the best way to know which is the better – and more efficient –treatment for you is to schedule a comprehensive treatment consultation at Borello Orthodontics. When you undergo an orthodontic treatment, your mouth will likely need a certain amount of time to adjust. You may notice a lisp when you talk during this period. The amount of time varies depending on the treatment, but any lisping should last no longer than a few days with Invisalign. In fact, plenty of people report no change in speech when they check in with our Sunset Hills MO orthodontist, and others only notice it for a day or two. Once your mouth adjusts, you’ll hardly even notice you have your aligner trays in. Many people think that because you get new aligner trays every two weeks, you must make an office visit just as often. You’ll be glad to know that this is a myth. Our Sunset Hills orthodontist allows you to order several trays at once, so you don’t have to come in as frequently. If you care for your aligner trays properly and practice excellent oral hygiene, having Invisalign will result in fewer office visits than braces. Let Our Sunset Hills MO Orthodontist Help You! 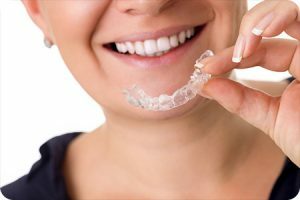 There’s much more to learn about Invisalign and other orthodontic treatments, and it’s important to take the time to do research before making any decisions. Your oral health is vital to your overall health, so be sure to let our Sunset Hills orthodontist know if you’re experiencing any issues or have any questions.